The pharmaceutical challenges to effective siRNA delivery and activity in vivo. The challenges for effective siRNA delivery and activity in vivo range from the effective empirical or in silico design and selection of an effective siRNA sequence to its chemical modification or formulation with delivery vectors to improve biological stability and pharmacokinetics (steps i–iv). 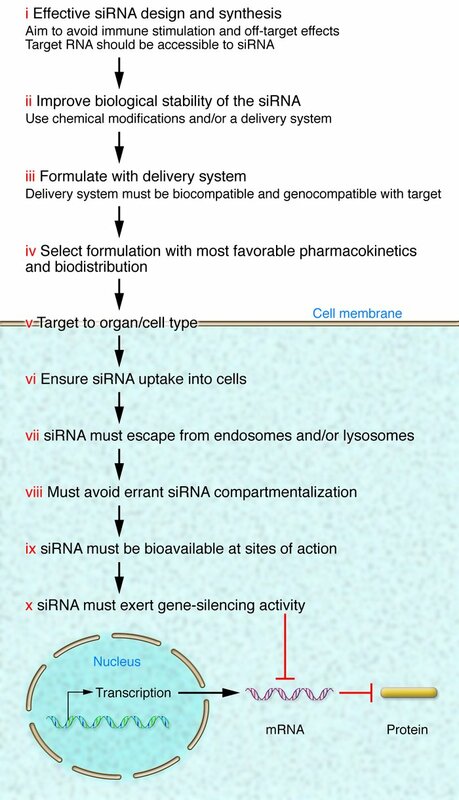 Optimally designed and formulated siRNA should then efficiently enter target cells and escape endosomal and other intracellular compartments to become highly bioavailable inside the cells so as to exert sequence-specific gene-silencing activity with no or minimal effects on nontargeted genes or inadvertent stimulation of the immune system (steps v–x) (see text for detailed explanation).